Gold Coast, Australia- November 29, 2016 – The latest offering from vMix continues to build on its industry leading reliability, performance and feature set in the live production market. 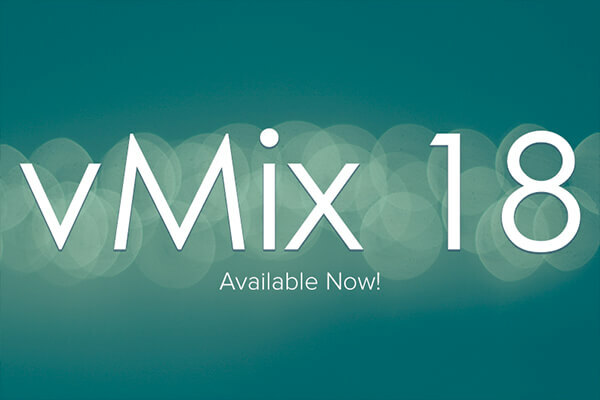 Fresh from the ground breaking feature releases of vMix 17 only 7 months ago, vMix again looks again to prove the huge possibilities of professional broadcast with the new vMix 18 release. In version 18, vMix adds support for external data sources to bolster live titling and data workflows, responsive control has been added to a wide range of control devices including MIDI and X-Keys Devices and Web Browser functionality in vMix has been improved to match the industry’s need for keyboard control over web content used in a production. Data Sources: Support for Data Sources including CSV, TXT, Excel, RSS, XML and even Google Sheets. This feature also allows data to be managed externally and is automatically updated. Activators: The ability to create your own responsive control surface complete with custom LED lights using standard MIDI and X-Keys devices. When combined with the existing shortcut functionality in vMix, Activators allow users to control their entire production with the press of a button. Instant Replay: Enhancements to the vMix Live Multi-Camera Instant Replay System help take live sporting events to professional levels. Web Browser Control: Fully-functional Web Browser with new keyboard control enables logins and searches when adding content. This Web Browser input adds the ability to view HTML 5 video, audio and content all from the vMix interface.